These are the guide-grade waders all the other waders want to be like when they grow up. **Only available through Simms' Custom Shop Program for an additional charge. 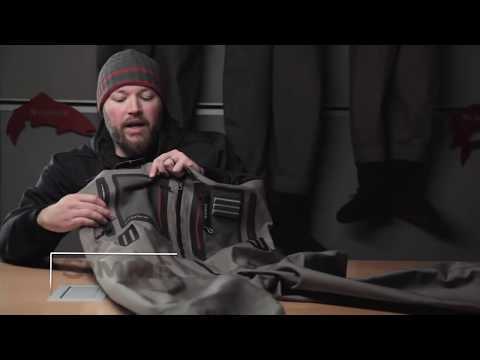 About the New G4Z Stockingfoot Why GORE-TEX®? I have worn a lot of waders (SealDri, Hodgman, James Scott Neoprene, Simms custom neoprene) and the G4Z is head and shoulders above everything else out there. They are very comfortable, sized for your body build, durable, have a great suspender system and are well designed. The booties are great being anatomically correct and the gravel guards are easy to put down and attached as opposed to other designs. The zipper really works well for venting body heat, and liquids and makes getting them on and off a snap. Being made in Bozeman and a great warranty, you really can't go wrong with these. At the same time I really had to think long and hard about the price tag as these are not moderately priced, but the most expensive wader out there. But, as my wife said, "you are really tough on gear, so get the best and it'll last you". So far have used them in rain, snow and some sun, and they have performed flawlessly. Great job Simms! I use them for kayak fishing and for wading rivers and surf and they are by far my most favorite piece of apparel I've ever owned. Amazing quality and comfort! only pair of waders that lasts the 4 month season guiding in Bristol Bay , AK which is certainly a feat. 120 days in a row in them 12 hrs a day. I hike through thick and thin to get to the best rainbow water, I fish in them almost everyday and they hold up. The best waders money can buy! These waders are simply luxury when worn. They are the perfect blend of comfort, craftsmanship and durability that you need in a wader. There's a reason these waders cost as much as they do, because they are the top of the line in quality. Like many of the comments on this review for the G4Z waders, I have nothing but positive things to say. I fish and live in in AK and literally live in my waders weeks on end. These waders never failed to keep me warm and dry. After seasons of abuse, they finally started to leak and a pocket zipper failed. I sent my waders back to Simms for repair, however due to heavy use the waders weren't repairable. Simms gave me a killer deal on a new pair. Workmanship on the Simms products is excellent and their customer service rocks! Thank you Simms Warranty/Repair Dept. Got approx 300 days in them before they went south. Now they leak everywhere and the inner layer has loads of bubbles and I am wet all over. Not nearly as good as my previous G4. They were worn out after 450., however no bubbles what so ever. So I am a bit disappointed actually. But since there are no other option available I will have to but a new par of waders. Think I will go back to the original G4. Bought these last year. Absolutely amazing! Easy to move in, comfortable and very user friendly. The front zipper allows you to keep cooler when walking or when you aren't wading too deep. Also makes it much easier when nature calls after standing in ice cold water for a while! I paired my with G# Guide boots. I couldn't have made a better choice. Thank you Simms! whether your doing crosswind down, or the falls on the copper all week, these things last me a 4 month season guiding in Bristol Bay, AK. i fully trust the zipper and love it for quick layering or de layering and wipping it out to pee everywhere. ive been very disapointed with simms quality degradation since the early 2000's but these are doing well thus far. im in them 125 days in a row in alaskan bush and generally need a new pair or some work after a season in AK. Being a guide, a great pair of waders that can hold up to the daily grind is a must. The G4Z is by far the best wader that I have ever owned, bar none. It has lasted much longer than I had anticipated. Previous waders that I have owned at most lasted a season with multiple repairs during that time period. ThIs pair has lasted 3 long seasons of walking through brush, wading serious pocket water, and getting stuck with clients flies. I would never buy any brand other than SIMMS. Oh yeah, the Zip has now become a must! Just ordered a second pair. Thanks for continuing to put out an excellent product. I've been fly fishing for over 20 years and have gone through many waders. Some were cheapies, and some well made. The cheap ones usually only lasted about 2 to 4 trips before the leaks started, but even the nicer ones (liek Orvis's Guide series) would leak after year, maybe 2. So nice waders run about $400 and last about 1 to 3 years. The G4Z at $800 is by far the best value. I've had my 1 and only pair for about 10 years now. I fished them pretty often for the first 4 years, then hung them up for a few years (too busy to fish), then fished them again for a few more. Just this past season, I got some small leaks, and sent them in to Simms for repair. I fully expected to be charged something, but they sent me an email saying all would be fixed...no charge. You just can't beat that kind of service. In addition to the stellar service, this is the most comfortable, well working pair of waders I've ever owned, and will never again be without a pair. I have this waders for 2 years and have a leak at the right food in the neopreen within the first year. I went back to my dealer and he sent it back to Simms. They said it was because of heavy use (??) and put some glue in the foot. It is still leaking and I wonder if this is the service of Simms. You pay for quality,... I didn't get quality nor service for my money. I will never buy Simms again. Thank you for the honest review. Please feel free to contact us at 1-800-217-4667 so we can work to help resolve this issue. Tried them all, still the best. Ive had my G4Z's for 5 years now, guiding in them in AK and then beating the crap out of them steelhead fishing and haven't had a single complaint. I have now tried several different manufacturers and had a couple different kinds, still love these G4Z's. I finally had my first issue with them recently, a small leak in the knees. I send them in for repair and what comes back, a brand stinking new pair of G4Z's! Simms, you guys rock! "The best there is...the best there was...and the best there ever will be!" Bret Hart. Nothing better than the Best! Waders are built extremely well. Love the zipper!!!! I made it through the guide season without any major issues that's fishing 10hr days everyday for 4 months and they survived what was left of the duck season. The only problem with the waders is they should beef up and add more loops for the belt. It is hard to keep pliers and pistol in place. They end up either by your crotch or behind you. perfect fit. LOVE the zipper. Bomber construction. Did I mention the zipper? aside for the obvious advantage when nature calls - makes getting into them so much easier. Pricy but worth every penny. I purchased the the Simms G4Z waders earlier this summer. Today was my first day on the water with them. They exceed my expectations in every way. Extremely worm, though as nails, and all around confurt. Most of my other fishing equitement is made by Simms. All Simms products are number 1 in my fish gear arsenal. Good waders aren't cheap and cheap waders aren't good. Had these for a full season now and love them. The zipper was the primary reason I bought them and has held up as marketed. Only my second set of waders in 10 years...my last pair were Simms as well. Quit reading and get on the water! I guide from a whitewater raft and do many hike-in days. From days sliding in and out of the raft to days spent bushwacking through the BC wilderness these waders have not failed. Alaska Tough Waders. Be American. Buy American. Yes, you can bust brush in the back country wearing any cheap old pair of waders, but how many of those waders will be hole free when you jump in the water? I put at least five to seven miles, a week, of Alaska brush busting abuse on my G4Z's and they haven't given up yet. Not only do they hold up to the abuse, but they wick away the moisture and leave you comfortable. They are hands down the best and toughest waders I own. I would highly recommend any of the G3 or G4 series of waders if you're a serious fisherman looking for serious gear than can handle what you throw at it. Plus, they're made here in America! Best waders in the business. Nothing else needs to be said. I just got this wader and have yet to use it . I'ved tried it on at home with my new guide boot and new G4 jacket and man do I look like a pro. The fit is perfect, I can't wait to put it to use. Here in Washington we get slot of rain and you need the best and Simms is it. I have long believed that you get what you pay for. The G4Z is the epitome of that thinking. Designed to meet the demands of those hardest on their equipment., the G4Z is by far the best wader I have ever used. Both in comfort and most importantly durability. I have gotten the longest out of my G4Zs as any wader I have owned. The zipper is great for relief as well as allowing them to air out(a great feature for those who spend day after day in them), and easy on and off. The fit is good for me. I have strip the exterior accessories off, so I have no issue with them. Pockets are well placed and functional. You won't be disappointed. I can literally destroy anything and after doing just that with mid-grade waders, I opted for the G4Z's. Other than the comfort and ease of use, these things are probably the strongest I've seen. I don't guide but I do spend over 200 days a year on the water, so I think I put these through the ringer with the best of them. I've fished in 20 below temps and never once felt the cold of the water, with just sweat pants underneath. Job well done in that department! If you do find a way to puncture these waders, as I did with falling in a ditch, their customer support is better than the waders. I had my waders back in nine days with no questions asked. I wreck stuff. I really wreck waders. Couldn't wreck these. Over two hundred hard fishing days, the absolute longest I have ever had a pair of waders last. Comfortable, well designed pocket system, great shoulder straps. Soon as there done I will be into a new pair. get the best ,away with the rest ! As guide i have these going for the third season - treat them well and you know why you paid the extra. they will last longer than you imagine - satisfied! also in scandinavian saltwater and big rivers for salmon. 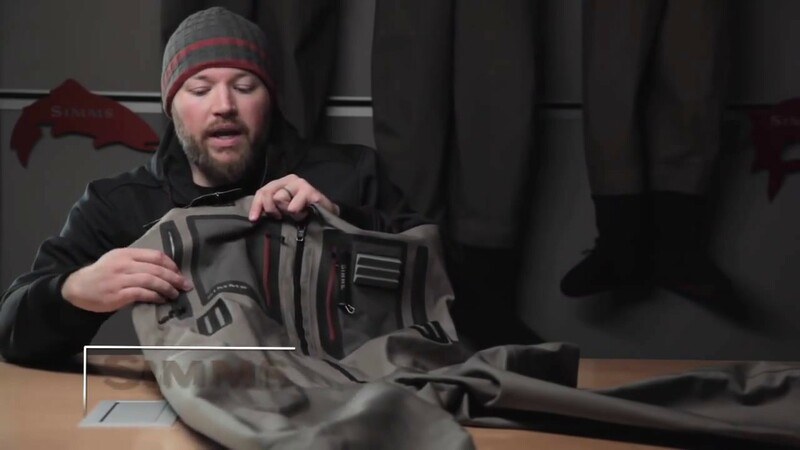 As a guide I go through about a pair of waders and boots each season. These waders stand up to the test. My only complaint is the sizing is off slightly and the tool holders are not safe from getting ripped off the front. I have lost two pair of hemostats and 3 pair of nippers. The G4Z Waders are the best waders I have used while guiding. They are extremely comfortable, flexible, and durable. The zipper technology makes it easy to add and remove layers. The G4Z worked great when walking the boat on the Henry's Fork or wading the Clearwater for steelhead. I highly recommend these waders. Good job Simms!